The Shallow Shad Rap is ideal for fishing skinny water. Cast it out, let it sit until the ripples fade away, then begin a slow, enticing retrieve. It is equally effective when twitching, casting or slow trolling. Carrying on a tradition that started in 1936, the original ?wounded minnow? action is what has made Rapala ?The world?s most trusted lure.? Premium Balsa gives them their responsive, life-like action, while the craftsmanship and dedication to excellence makes sure that each and every lure swims like the first. Classic lures embody the same individuality that Lauri Rapala was hand carving from wood those many years ago. With every Classic lure purchased, you really are buying a part of Rapala history.Before leaving the factory, each is inspected, hand-tuned and tank-tested for the superior quality these lures are known for. That?s why no matter where you go in the world, big fish eat little fish that swim like a Rapala. 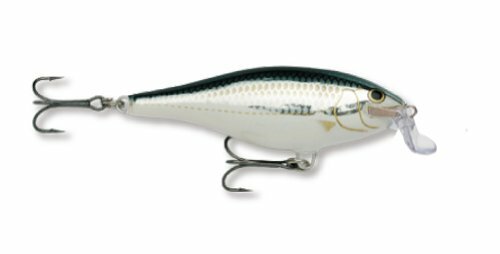 Use the Shallow Shad Rap to imitate high profile baitfish. The smaller sizes are highly effective in rivers for different trout species. The 9 cm model also attracts larger predators. Troll the Shallow Shad Rap slowly on a flat line with no additional weight over weed beds and shallow shoals to catch fish that you couldn?t get to with deeper running lures. When trolling also looks for birds flocking and diving into the water; most likely they are attacking schools of baitfish, chased to the surface by predators. Trolling shallow running lures in the close vicinity of this kind of action can produce nice fish and make your day.